Pursue them like your life depends on it! Whatever you’re dreaming to create, how are you pursuing it? Like a hobby? Like a job? Like a fire is lit under your feet? 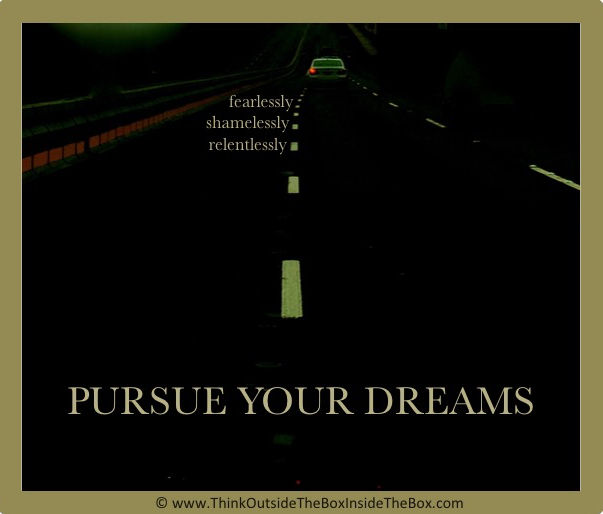 However you pursue your dreams will determine whether you reach them or not. Do you actually believe manifesting your dream is possible or do you just like fantasizing about the idea of it? Are you seriously pursuing your dream or simply playing at it? Are you pursuing your dream with love, joy, excitement, and commitment? Are you continually researching, learning, and educating yourself on the craft, skill, technique, and business of your dream? Are you constantly finding new ways to practice, share, express, improve at the dream you are pursuing? Are you boldly asking for help, opportunities, resources, and time for your dream? Are you consistently taking action towards creating your dream?